Doug with GENUINE RISK, the oldest living Kentucky Derby-winning filly. (Photographed by Farm Manager and friend, Buck Moore, at Newstead Farm in Upperville, Virginia, in August, 2006). Newstead Farm, along with Genuine Risk, was one of the featured chapters in Doug's national award-winning bookÂ PRIVATE ACCESS. GENUINE RISK passed away peacefully in her paddock in the fall of 2008. For nearly four decades, world-renowned equine photographer Doug Prather has passionately pursued one goal: capturing the essence of the horse in harmony with nature. His photographs provide a window to the lush beauty of the Bluegrass, and offer an intimate invitation to surrender yourself to the spirit of the horse and the serenity of the surrounding landscape. With an artist’s eye for beauty and balance, and a horseman’s understanding of equine anatomy, Doug’s works are treasured by those who appreciate excellence in Thoroughbred art. Several of his limited edition photographic prints have sold out and have become extremely valuable to collectors. Even before he received his Fine Arts degree from Georgetown College, it was evident that Doug was blessed with a gift of natural talent: the innate ability to create unforgettable photographs and art. In his early twenties, he was hired as the Art Director for the largest Thoroughbred horse advertising agency in the county. 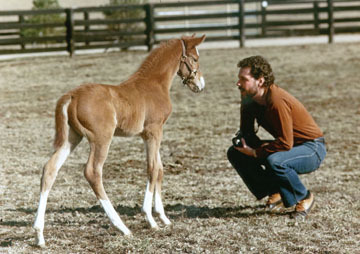 A younger Doug, always with camera in hand, saying hello to the Blushing Groom-Track Robbery new born filly (who would be later named Res Nova) at Hill 'n Dale Farm in Lexington, in 1984. When this picture was taken, Doug had already been creating Thoroughbred horse advertising art for 12 years. The next year, in 1985, Doug would create the very first in his signature line of equine lithographic prints "Kentucky Morning Turnout". Gates of America's Premiere Horse Farms and Ranches". This 252-page, designer table-top book won the National "Best Pictorial Book" First Place Award presented by American Horse Publications. Over the years his photographic art and graphic designs have received national and international awards. His photographs have graced the covers or pages of magazines such as Keeneland Magazine, Breeders's Cup, USEF Equestrian, The Blood-Horse, The Horse, Town and Country, Southern Living, SKY Magazine, Cowboys & Indians, Time, Newsweek, U.S. News & World Report, Farm and Ranch Publications Group, and other publications. 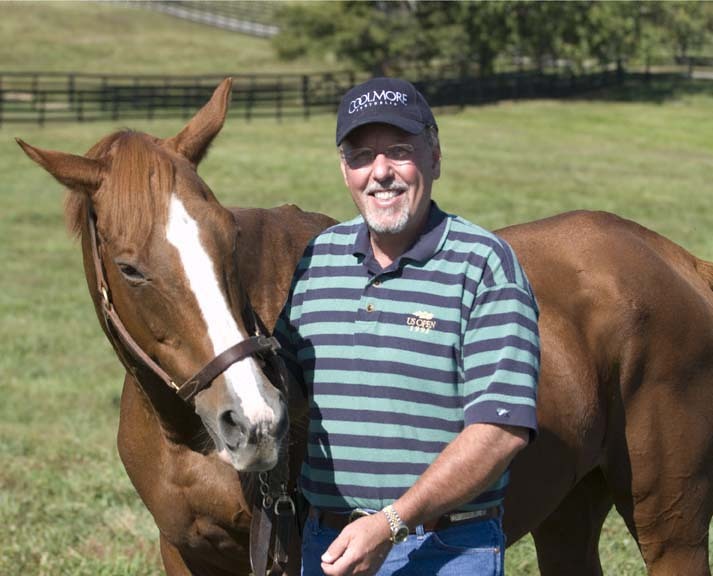 Doug Prather is an active member of AIPS (International Sports Press Association), IAEJ (International Alliance of Equine Journalists), NSSA (National Sportscasters and Sportswriters Association), and numerous other equine related organizations.